Help the Arenthian resistance drive out the Colovians. The town of Arenthia has been occupied by a Colovian force. I've been tapped to help retake the city alongside a Khajiiti resistance force. (Optional) Obtain a Colovian Uniform. Listen to the Magical Projection. Search the Tower District for clues. Talk to Cariel behind the tower. Use the imprinting crystal on one of the projections. Talk to Cariel in Arethia's center. Talk to Cariel outside the bridge to Arenthia. She informs you that Colovian invaders have taken the city. Cariel is helping the local resistance and its leader, Kazirra. You need to disguise yourself, using the dead scout's uniform, then head to the safe house in the market. It is the hut with a lion statue. You should also check out the propaganda illusion in the market. Search the Highland Archer and take the Colovian Uniform. You don't have to equip the disguise, but you do have to enter the city and listen to the Magical Projection. Enter the Inconspicuous House, which is located between the Mages Guild and the armory. The house is full of resistance fighters. Talk to Kazirra, Clanmother of Arenthia. The Stonefire cult is behind the Colovian attack. They are a group of Worm Cultists led by Javad Tharn. 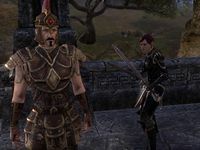 If word gets out that the Colovian General consorts with Daedric cults, the Colovians will leave. However, General Lavinia will never crack. You need to get the confession from the second in command, Centurion Gavo. If you can find his plans, you will know where to find him. You need to search the Tower District, named for the large tower at the back of it. Cariel will meet you there once you've found some information. The Tower District is south of the Inconspicuous House. You need to look in four buildings. In Agapitus' House, on a bookshelf in the lower level, is Admission Denied; on the table is Gavo's Itinerary; and upstairs between two beds is Who Asked Them Here?. In Hirraxim's House, on the lower level is The Key to Projection and the Imprinting Crystal. Upstairs is Not That Bad and These Damned Cats. In Henlor's House, on the lower level is Funny Stuff, Sil and Big Damn Bugs. On the upper level is Why the Projections?. Inside Zabibi's House, Await My Emissary is on the ground floor. If you want to find the clues quickly, you should read Await My Emissary in the first right house, then search the last two houses for The Key to Projection and the Imprinting Crystal (both inside Hirraxim's house on the left) and Gavo's Itinerary. Meet Cariel behind the tower when you have all four clues. You will pretend to be Tharn's envoy. You will wait at the top of the tower for Gavo, then distract him, so Cariel can take him hostage. Enter the tower and look north. You can see Gavo walking up to the tower and hear him conversing with a sentry. Once he appears inside the tower, talk to Gavo. After you tell him you think he will be perfect, Cariel hits him with her sword. Talk to her. You will disguise yourself as Gavo using an earring and walk him out the front gate as your prisoner. Put on the earring; it is in your quest items. Head back to Kazirra with Gavo. The crystal you found will allow you to record Gavo's confession and broadcast it all over the city. Use the Imprinting Crystal on Centurion Gavo in the corner. "Tell us what you are doing. Who is behind the sack of Arenthia?" "We are in league with the Stonefire cult. The cultists are here. They are hidden behind the walls of the Temple District. They're performing a ritual, preparing the way for a Dark Anchor. They work under the orders of Javad Tharn, the necromancer." Talk to Kazirra. Take the crystal to one of the projection stands. It should imprint the image all over the city at once. With the Colovians broken, you should find Lavinia in the inn and kill her. Use the crystal, then head east of the Arenthia icon to the Residential District. Go to The Pious Arenthi-Inn. Mane Akkhuz-ri talks to the General then disappears. Return to the town center, and talk to Cariel. She tells you most of the Colovians are on the run and gives you a reward.